A entry level flash for those people that doesn't want to use something besides the flash that is on the camera. It is the Nikon Speedlight SB-300 that were introduced today. It got a bit more flexibility in how the flash head can turn than the SB-400, so it can be used to bounce on the celling in the room instead of just shooting the light straight out like the on board flash does and the Nikon Speedlight SB-400 does. You can' turn the flash to either sides as you can with the bigger flash models, which would have been a great feature. That would have made the flash a home run and it is strange that it doesn't have that feature. A small flash that can turn in any direction like the bigger flash would have been a great sales hit as sometime size and weight does have an effect on the equipment you pack. It has almost the same specification as the Nikon Speedlight SB-400, which only advantage is that it has a little bit more of flash power than the SB-300, but it is very little. 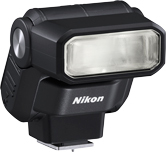 At the same price level you should really go for the new Nikon Speedlight SB-300 as it has the possiblity to bounce the light of the celling and it is also smaller and lighter.